Building Blocks for Kids (BBK) is training young appetites towards healthy eating by adopting a new nutrition policy for their Preschool Enrichment Program. Established in 2005, Building Blocks for Kids supports the development of healthy children and self – sufficiency of families that live in the Iron Triangle neighborhood of Richmond, California. The collaborative of local social service and non-profit agencies (like YMCA, POGO Park and Healthy and Active Before 5) and residents gather to share their individual expertise while at the same time receive training in order to best serve the needs of the children and families within the Iron Triangle. One such program, BBK’s Preschool Enrichment Program (PREP) provides child care for parents enrolled in classes (like GED or ESL) at the Nevin Community Center. PREP strives to emulate the preschool experience by providing their 66 enrolled young students free play, snack time, and a curriculum of math, science and the arts. 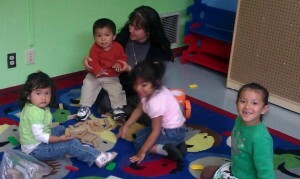 The children of BBK’s Preschool Enrichment Program get at least 20 minutes of free play every morning. Before working with Healthy & Active Before 5, PREP served beverages like Juicy Juice and other not-so-healthy foods during their morning snack time. Lakisha Hill, Preschool Enrichment Program’s Coordinator says she wanted to make changes and adopt a new healthy food policy to follow BBK’s mission of developing healthy children. Although a few children still ask for juice, many are open to trying new things and are eating fruits that they haven’t tried before. BBK staff feel good about giving the children in their program a healthy start. Yay! Congratulations to BBK’s Preschool Education Program on their commitment towards developing healthy children!